I’ve seen this sort of thing around on other blogs. And I wanted to post something today so…. hey, why the heck not. Well, this month is a big month on the Blank Mastermind timeline, so I’ve been writing a lot of short stories/deleted scenes on the appropriate days to keep myself entertained. For fun facts, have a little timeline I wrote up for the month. Wolfgang moved out from home to work in the city this month. He came back for Eloisa’s 14th birthday to take her to a dance. Dallas is very newly recruited into the hero program and turning 15. still in training stuff and getting used to dealing with superpowers/getting them integrated and working with side effects. this is his first full year after his brother left for the army + when his social anxiety stuff is arguably at its worst. Derrick Mansley is launching the Hero Project to the public. And starting to get worried as he looks at the long term outlook of the hero plan, due to their distinct lack of villain. So hey that’s all fun, right? That sort of stuff was my main project, plus a little bit of fanfic for friends’ characters. Aaand then a little bit of my newest project. I haven’t said a lot about it on here (-cough- anything, actually.) but I am actually working on a new book. That “no-villain comedy” novel that I’ve been poking around for a long time? Yeah, finally got around to start writing that. A comedy about babysitting called “Say Uncle”, and I’m very proud of it. Micah MacQuoid has the easy job. His parents have to deal with all the aftermath of his older sister’s death. His brother is driving over to try and keep his parents from getting a divorce amidst all the wreckage of the tragedy. All Micah has to do is watch his brother’s four kids while all that drama goes down. Sure, that’s not exactly something he’s had experience with. He’s got more experience playing his drums in his parents’ basement and avoiding human interaction. But they’re family. They’re his nieces and nephews. Just four sweet little kids to watch for a month at most. He just doesn’t expect the endless allergies, school problems and adventurous endeavors the kids have over the summer. Plus, an uncle they barely know? Where’s the motivation to do anything he says? Maybe the easy job isn’t such a piece of cake after all. I shall share a few snippets to let you all in on that fun. More footsteps slapped around in the halls and a few of the kids poked their heads in to look at me. Tiny looked stricken and started to cry. Oh great. Just great. Not ten minutes in and I’d already made one of them cry. “How do I get it out?” she sobbed. “I wanna sleep with Gerald,” Rudy’s muffled voice came from under the covers. I sucked in my breath and jumped back, looking over the dresser. Sure enough, right on the other side of the dresser sat a big, glass case with a white and orange snake coiled up quietly inside. He watched me with beady black demon eyes. I’d seen more than I wanted to see here. I took a few steps further back towards the door, rubbing my hands on my jeans. “Okay. Well. Goodnight.” I slipped back out the door and closed it behind me. I took a few seconds in the hallway, waiting for my breathing and heart rate to go down before deciding on the next room to go into. and going to a classical music event thing. Also discovering a couple neat songs by “Oh The Larceny” listening to some of Costantino Carrera’s piano stuff. Very cool. And I’m so prepared for this question here because look at me, I’ve actually made a playlist for this month. I watched Justice League earlier this month. It was… okay? I mean, some really cool effects, but it’s one of those things that I can so easily spot a few writing problems in it that would make it soooo much better if I could just fix it…. so it was kinda frustrating. I approve of the Flash casting though. Agents of SHIELD has also been a thing. Really awesome characters and plots and I’m enjoying a lot so far. Weekly episodes of Timeless are a thing for our family now and season 2 is doing some pretty interesting things. Conflicted on some fronts here, but mostly some good stuff going on. This evening we also saw the movie, “Darkest Hour”. Not usually the type of thing I’d get drawn into, but honestly this was very well done. Also, something I’m very excited about, my brother found a copy of Randall Munroe’s book “What if…?” at a library book sale. This book will never cease to entertain me and I’m very happy to have it. 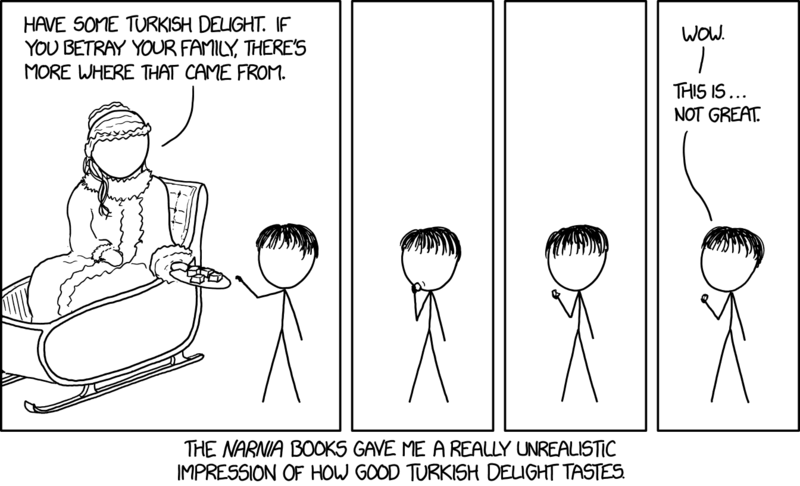 Please enjoy this small comic also by Randall Munroe that made me laugh way too hard. Gardening. Sticking seeds in dirt in buckets and hoping they’ll grow up good and strong. GED study + testing things. Going to a butterfly palace with my siblings and learning a lot about butterflies. I got a pretty blue one to land on me so I was very proud. Macarons. Guys. I can make these now. I successfully made a batch of little pink macarons and I literally squealed at the oven when I saw how perfect they were. Bible reading stuff and kind of trying to figure out a few things about Job. Eh, well. I do have a few plans. More story writing. More work is scheduled + more school things. How was your April? What have you been up to? Seriously though. O.o how did the month go by so fast? Yeah I know right? XD I’ve had it on my “me” board on Pinterest for a while now. ALSO YOU LIKE COLONY HOUSE TOO? O-O DUDE YES. FAVORITE SONG? I’ve been playing Cannot Do This Alone on repeatttt for days. They’re fantastic!!! my favorite is Waiting For My Time To Come right now. Silhoettes (or however the heck you spell that) was the first one I found and liked. Also You & I and This Beautiful Life are really awesome. Oooh yesssss I love those too! You & I is one of my favs! Did the first publisher not take it then? I’ve been up to violin. ’nuff said. O.K., and reading. Thankfully I still have time for reading. Well that’s nice! Sort of. ;D I’m sure you’ll find someone. Eventually. Ho, cool! That’s a way. Kate’s going to be self-publishing her first thing-to-be-published later this year (at least that’s the plan), a Snow White retelling novella. Nothing super huge, but it’s her first to try publishing, so…we’ll see how it goes. Macarons are the best though. ❤ so fun to make.